Make make your application and Personal Statement stand out. Physician and US journalist review and editing of your CV and Personal Statement. Affordable, if you just want to get started. Learn what it takes to maximize your interviews. Guidance on which programs to apply to. Set up unlimited 30 min sessions (till September 15) to get guidance on your application and Personal statement. 1:1 mentor session with assigned physician (one session) to review your Personal Statement and CV. You will then be assigned a physician from our team who will work one on one with you, individually, to customize your application and PS. ​We also have US Journalists on our panel to will work on your application and PS to ensure grammar and structure errors are removed and the best practices of the English writing are followed. Other classes may be available for upgrade, based on space availability. The complete set of classes and the curriculum is available at our Classes and technology section. Based on the physician discussion, if there are changes, you will be expected to incorporate these and send the PS and CV back to us. 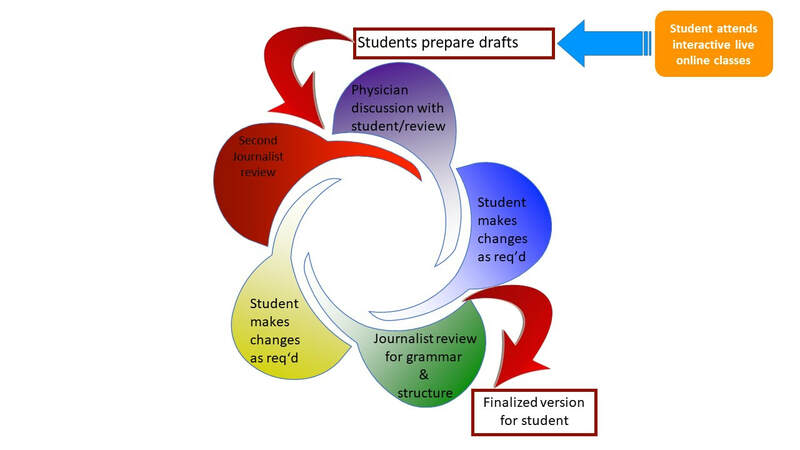 At this stage the first review by our US journalist takes place for grammar, structure and flow. Based on the journalist feedback you can do another round of changes which is again reviewed by the assigned journalist before the PS and CV is finalized. ​So not only will you work with our physicians your application and PS will be reviewed by US Journalist on our panel to ensure a completely professional package.